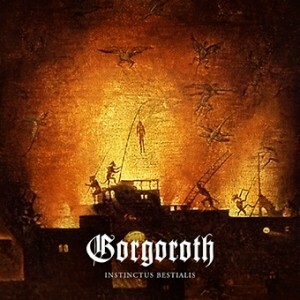 Gorgoroth – Instinctus Bestalis – Soulseller Records – Release: 09-06-2015. It’s been a while since a new Gorgoroth record hit the surface. And to be honest due to all the shite concerning Gaahl and after some really bad Gorgoroth live performances I witnessed I had lost quite the interest in these Norwegian Christ rapers. On the other hand, when I heard that Gorgoroth spawned their ninth effort my interest was tickled and I was curious to hear if riffmaster Infernus still had some black balls to blast. Well, let’s hit play and see which way this journey goes. For those who did not hear the news yet: after Gaahl, Infernus got rid of vocalist Pest too. So let’s start with newbie Atterigner who also had vocal duty for the amazing band Triumfall. I must say I like his style. His grunting fits the 90s BM style Infernus and co. tried to achieve with “Instinctus Bestialis”. Nasty vocals is what we want from Gorgoroth and I must say I prefer the vocal styles of Atterigner over those from Pest. Of course no one can replace the mighty Gaahl. Atterigner got the job and he is handling it very well. Enough about the vocals, time to talk about the music. The tremolo is doing overtime and the BM style Infernus and co. unleashed upon us is a pleasantly soothing one. The pace of the drums really gives that hypnotic BM state of mind. It sounds like Gorgoroth is trying to regain their sound of the early days. At some parts they really lean a bit too much on the powerful riffs of “Antichrist” and the mighty classic “Twilight of the Idols”. Don’t expect to be blown away by a new and improved Gorgoroth. “Instinctus Bestalis” is leaning a bit too much on their previous efforts for that. Still, Infernus created a sinister record with “Instinctus Bestialus”. There is just that little bell blasting in my head, saying: “This record could and should be much more”. It isn’t that mind blowing BM record we hoped for. Still, Infernus and co. have enough skill and passion to put out an above average record. Lamb Of God – Signing with Nuclear Blast, new album in July!